The KL Monorail - Great fun to travel on! The KL Monorail is an urban monorail system in Kuala Lumpur, Malaysia. It connects the Kuala Lumpur Sentral transport hub with the "Golden Triangle". It serves 11 stations running 8.6 km (5 mi) with two parallel elevated tracks that links areas of inner Kuala Lumpur previously not served by rail transport. 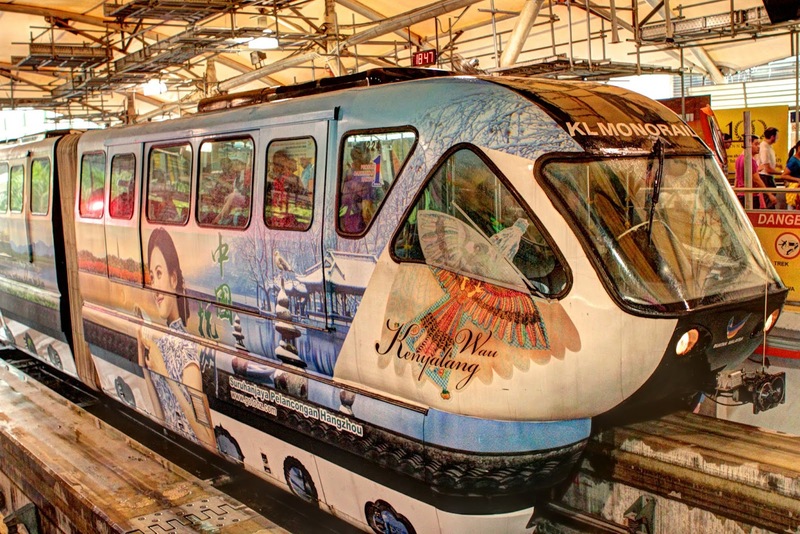 On March 2012, KL Monorail was integrated with the Ampang Line light rail transit when the "paid-up" or restricted areas of the Hang Tuah monorail and LRT stations, and also at the Titiwangsa monorail and LRT stations, were physically linked up, allowing transfers without the need to buy new tickets for the first time since the system became operational. The stations are designed as elevated structures with ticketing facilities on either the ground level (as seen in the KL Sentral station) or the first-floor level. The platforms are on the top floor, separated from the monorail lines with fencing and covered with a large canvas roof. Certain stations are situated above roadways, or are slightly longer than others. Each station is also designated with a sponsor, with route maps associating each station with a particular product brand. 1.KL Sentral – Next to KL Sentral at Jalan Tun Sambanthan. Monorail is not connected to KL Central. You stop at last station named Brickfields , then you should walk to KL central. At KL Central, you can go to and from the airport Kuala Lumpur International Airport (KLIA). It is about 70km south of the city centre. If you are near to KL Sentral or can get there easily, the fastest way is the high-speed KLIA Ekspres train, which costs RM35 and takes 28 minutes. If you are far from the centre of town, a taxi may be easier or faster. Fare and journey time depend on distance and traffic, but a typical trip costs RM65 and takes one hour. AirAsia flights use the Low Cost Carrier Terminal (LCCT),which is not served by the train. Skybus routes from KL Sentral to LCCT cost RM9 and take 70 minutes. At Brickfields area, there are a lot of the Indian restaurants. You can enjoy the roti canai that serve with fish, chicken, mutton or dhal curry. Or you can have another dishes of the thosai that is served with chutney (made of coconut). 3.Maharajalela – Next to Stadium Negara (National Stadium), near China Town (Petaling Street). 4.Hang Tuah – Next to Ampang LRT line, near to Pudu Prison. In 1996, after 101 years as a prison, Pudu Prison was formally closed, It was used as a museum for a period in 1997. In June 2010, the eastern wall of the Pudu Prison complex was destroyed to make way for a road-widening project. By December 2012, all buildings within the Pudu Prison complex were completely demolished, with only a part of the exterior wall and main gate still standing. 5.Imbi – Between Plaza Berjaya and Berjaya Times Square. 6.Bukit Bintang - Between Sungei Wang Plaza and Lot 10 shopping centre. This is the hub for shopaholics and epicureans. Walking distant from the monorail stop, just along the streets at Jalan Bukit Bintang, are the Sungei Wang Plaza, Lot 10, Bukit Bintang Plaza, Starhill, Low Yat Plaza and Bintang Walk. From IT gadgets to kitchen ware and branded clothes, you can get it all at these outlets. 8.Bukit Nanas – Near Concorde Hotel. Just a 5 minutes’ walk from the Bukit Nanas stop is the Bukit Nanas Forest Reserve, a virgin tropical rainforest getaway in the heart of bustling Kuala Lumpur. This approximately 11ha tropical rainforest also has a trail that leads to Kuala Lumpur Tower in 30 minutes. You get to see the tower, among the many things and trek at a place surrounded by lush greeneries. Bukit Nanas Forest Reserve is open every day from 9am to 5pm. 9.Medan Tuanku – Near Sheraton Imperial Hotel. The famous Asian Heritage Row, located at Jalan Doraisamy is a stone’s throw from the Medan Tuanku monorail stop. Heritage Row displays a stretch of happening clubs that plays retro, R&B, techno and contemporary music. You can pick your genre of music from about 20 clubs/bistros available there. Just to name a few – Bar Savanh, Loft, Sunshine and The Rupee Room has among the best music for you to rock the dance floor all night long. All you need here is your dancing feet. The clubs here open till 2am. 10.Chow Kit – At intersection of Jalan Ipoh, Jalan Pahang, Jalan Tuanku Abdul Rahman, and Jalan Raja Muda Abdul Aziz. 11.Titiwangsa – At Jalan Tun Razak, next to Ampang LRT line. from this station take Bus #120 or walk (20-30min, need to cross some major roads) to Lake Titiwangsa, also known as Taman Tasik Titiwangsa. It is a recreational park and lake north of downtown Kuala Lumpur with good photo opportunities and the adjacent Istana Budaya, an arts and culture centre. At rush hour, the train is very crowded. if you like watching people goes by and took some street photos, it is a good time to go here. Trains run from 6am to midnight, every 2-5 minutes during peak hours and 5-10 minutes off-peak. The fares range from RM1.20 to RM2.50, which can be paid using single-journey tickets, Stored Value Cards (which cannot be used on RapidKL LRT's), and with Touch 'N Go Cards (which can be use on the LRT as well as other selected places). Great fun to travel on!